This is the fifth week of Reading Countdown to the Anthony Awards at Bouchercon 2016. Now there are 11 weeks (75 days to be precise) until the 2016 Anthony Awards are presented at the Bouchercon XVLII World Mystery Convention. This week I suggest you read the fifth nominee alphabetically in the Best Paperback Original category, James W. Ziskin's STONE COLD DEAD. 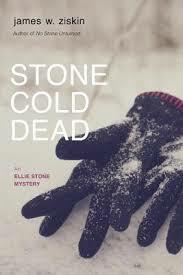 STONE COLD DEAD, James W. Ziskin's third novel in his Ellie Stone Mystery series, was published on May 12, 2015 by Seventh Street Books. This historical fiction crime fiction series features Ellie Stone, a modern "career girl." The debut STYX AND STONE began in 1960, and Ellie had returned to New York City because her academic father had been attacked. In STONE COLD DEAD it is December 21, 1960. Ellie is now working as a reporter for a newspaper in upstate New York. Darlene Hicks, a fifteen-year-old girl, has gone missing. By New Year's Eve Darlene's frantic mother Irene Metzger contacts Ellie for help. Irene says local police believe Darlene has run away with a boyfriend, and aren't pursuing any leads. Only Ellie can help find Darlene. James W. Ziskin pulls off a crime fiction novel hat trick. Ellie Stone is a woman protagonist who, in any time period, is fully developed and fascinating. The early 1960s are drawn to perfection, so much so that the reader's nostalgia is quickly replaced by the reality of what "the good old days" truly means. Then there is Ziskin's writing. His novels are tightly plotted, the pacing on point, the suspense is taut, the characters are solid, and the prose is so enjoyable. James W. Ziskin's STONE COLD DEAD was nominated for a 2016 "Lefty" (Left Coast Crime) Award for Best World Mystery Novel. The novel also is a finalist in the Best Paperback Original category for a 2016 Barry Award. You can order a copy of STONE COLD DEAD through these links at IndieBound, Amazon, Barnes & Noble, or at your local independent bookstore. Note: HEART OF STONE, the fourth Ellie Stone Mystery, was published on June 7, 2016.